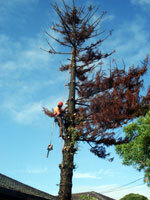 Sydney Tree Removals has helped many residential and commercial properties in Frenchs Forest recover from storms. The devastated trees on their properties were quickly removed to ensure the safety of the families and employees that reside on them. We have continued our relationship with many of our customers, returning to the Frenchs Forest to provide property maintenance, tree pruning, and commercial tree services. Our customers have learnt that prevention is always better than repair. Do you have any branches or trees that pose a risk to your building and safety? Once a tree has reached their useful life, been poorly maintained, lopped in the past, or damaged by storms - they can become a liability and threaten your property or family safety. We are able to travel anywhere in the Northern Beaches to give you an unbiased assessment of your tree needs and quickly and efficiently provide practical solutions in removing them. Safety is one of our greatest concerns. We conduct ourselves as professionals in Frenchs Forest, and as such we prepare the appropriate safe work method statements and conduct hazard assessments prior to commencing work. This keeps us, and your property safe. 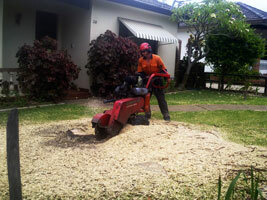 We have many years of experience performing stump grindings in Frenchs Forest and for the whole Northern Beaches. There has never been a stump grinding job that is too big or small for us. We always rise to the challenge. All the tree related services we prove in Frenchs Forest and across Sydney are performed expertly by arborists, and with utmost care. Sydney Tree Removals has an excellent record for stump grinding, and we want to keep it that way. So when we are stump grinding on your property, you can be assured that you are getting the best tree service in the whole Northern Beaches.